Yahoo has rolled out a new look for its email service across the desktop, iOS and Android that ushers in a cleaner design and new features like the ability to view messages in a threaded conversation, rather than individually. It also increases storage space on the service to 1TB for all users. The revamp also brings new shortcuts for things like searching for all messages from a particular sender, starring a message and deleting directly from the quick actions menu that appears when you hover over or open a message. 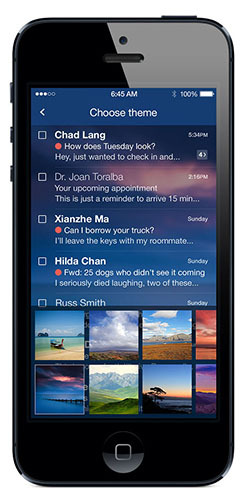 Other new features include the ability to use your own images, including Flickr photos, as a background for your mail. The chosen image will sync across all platforms. The redesign has been timed to coincide with Yahoo Mail’s 16th anniversary, and in celebration, also brought features like disposable email addresses, enhanced filters and automatic message forwarding – all of which had previously been reserved for Mail Plus users – to all.